Knot of the Soul Book Event: A Political Theology of Jinn? Stefania Pandolfo’s book provides us with an intersecting account of the wounds left open by the trauma of colonization in Morocco. It is less a theoretical work than an attempt to be true to the lives and experiences of those to whom she has lent her ethnographic ear. 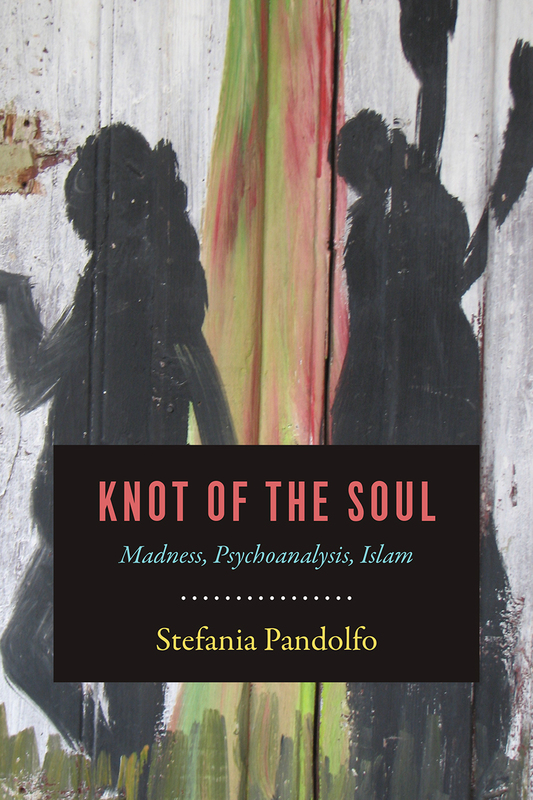 Their lives and experiences are outlined and unfolded in terms of dialogue between Islamic psychology and psychoanalysis that she finds to be already well underway—not only in colonial and postcolonial debates over psychiatric practice in France and Morocco, but in the most authoritative texts of psychoanalysis itself. Yet even this framing is inadequate, as her rich exploration of the artwork produced by Ilyias while in a psychotic “state” (hāla) draws on the aesthetics of Aby Warburg and Giorgio Agamben as well as Islamic thought on the importance of the image and the imagination. Here above all, we can see that her theorization follows her ethnographic subject rather than the other way around—a priority that had already become clear in Chapter 6, “The Burning,” which is made up largely of her interlocutors’ debate over whether risking the passage to Europe amounts to suicide. Indeed, she concludes her work with a harrowing account of the Imam’s use of Qur’anic healing to drive out a jinn. There is much in this work to instruct a Western reader—I certainly learned a great deal. Few academics in the West know much of anything about the history of public policy in any postcolonial society, and in that respect her discussions of the debates surrounding psychiatric care in Morocco were very informative. Here and elsewhere, she shows the Western debate to be parochial and narrow compared to what is found in the postcolonial world, where intellectuals engage with Islamic traditions and Western thinkers as a matter of course. Hence when she draws her own analogies with Freud, Lacan, Warburg, Agamben, or any number of other Western thinkers, it comes across as a suggestion or a hypothesis rather than an “explanation” in any strong or reductive sense. She never claims that the jinn simply “are” unconscious drives, for instance, even if psychoanalytic explorations of the drives can shed some light on the dynamics of the fraught relationship between human beings and jinn. If the Imam can live in a world in which Western psychiatry and Qur’anic healing can coexist without fully reducing one to the other, then so can she. The Qur’an makes high claims for its clarity and internal consistency, and as I have spent the week reacquainting myself with it in class, I am coming to a fresh appreciation of how radically focused it is. Calvin claims that the Bible is never telling us anything we don’t really need to know, but that is a retrospective hermeneutic principle — the Qur’an really is like that from the very beginning. Nothing is placed in there simply to satisfy your curiosity or clarify “in-universe” details. Everything and everyone is radically on message. Classical Shari’a was never a standard code of law that can simply be applied — instead, it was an attempt to discern the ultimately unformulable perfect divine law that only God knows. Hence the practice of law grows directly out of the radical monotheism of Islam, which denies any commensurability between God and humanity. In classical Shari’a, law was independent of the state in a way we can’t really imagine today. While the sultan or other ruler was required to administer some punishments, the practice of Shari’a law was monopolized by a self-selecting group of scholars. At the same time, Shari’a was never the “only” form of law — the sultan and police often ran their own courts, which were much more flexible and practical in certain instances (because the burden of proof for securing a criminal conviction in Shari’a is extremely high, so that even obviously guilty individuals may wind up going free). Classical Shari’a only arose centuries after the rise of Islam, as a practical solution to political conflicts at that time (namely, a trans-national Islamic community divided into smaller political units). Law was practiced differently in Islam before that, and presumably it would also be legitimate to practice law differently after that (as is in fact the case in virtually all Islamic countries). Classical Shari’a was never any one thing — even in its most established form, it stabilized into four different schools of law, within each of which there was still room for debate. In contemporary parlance, “Shari’a” has more often served as a rallying cry than as a concrete proposal, and attempts at literalism have ironically enshrined some of the most severe punishments as “Shari’a” when they were actually little used and significantly ameliorated in classical Shari’a. The emphasis on the “worst” provisions of “Shari’a” often has more to do with an attempt to differentiate Islam from the West than with any substantive commitment to (or even knowledge of) Shari’a law as it was actually practiced in pre-modern times. tl;dr: The system of classical Shari’a law is fascinating, but it would be impossible to restore it in the modern world. People who claim to be doing so are not in fact doing so. Caliphate and Katechon; Or, Is Sayyid the better Schmitt? Early in Recalling the Caliphate, Sayyid recounts an attempt by then-Iranian president Khatami to bridge the gap between his country and the United States by appealing to Alexis de Tocqueville. As an instructor at a school in the Great Books tradition, I found this story to be illustrative of the limitations of the Great Books approach insofar as it showed how empty the claim to universal values is in practice. In principle, custodians of a canon of universally applicable texts should be thrilled when someone from another cultural tradition finds a canonical text appealing. In reality, though, Khatami’s attempt to enter into the Great Conversation was met with outrage and derision. This reaction is of course conceptually incoherent, and that’s because claims to universality for the “Western canon” — indeed, even the very existence of something like the “Western canon,” which Sayyid characterizes as a “hegemonic project” and a “contingent stitch-up” (pg. 55) — are not conceptual claims, but political ones. This means that they are conditioned by the friend-enemy relationship that, for Sayyid, runs above all between the West and the non-West in the contemporary world. Insofar as he was an enemy claiming possession over Western property, therefore, “Khatami had to commit an act of violence that was prerequisite to his attempt at dialogue” (pg. 28), and the reaction he received was every bit as violent. A Nietzschean reading of Islam: could Islam be read as an attempt to develop a form of prophetic monotheism that embraces master morality rather than slave morality? Particularly striking here is that none of the Qur’anic prophets are martyrs — the Qur’an even refuses to admit that Jesus really died on the cross, and it rejects Christian monastic asceticism as well. Further, could Shi’ism, with its attachment to lost causes and defeated martyrs, be read as a reintroduction of slave morality into Islam? Comparing Muhammad and Paul, starting from the similar ways both deploy Abraham as a way of maintaining both continuity and contrast with the pre-existing monotheistic tradition. I’ve written up some thoughts on this previously, and it seems like the topic I am closest to being equipped to write about “officially” (after reading some of the Islamic critiques of Paul mentioned in comments to that post, to be sure). Repeatedly in the Qur’an, we read that God has created humanity male and female. This duality plays a directly theological role: in contrast to God, who is absolutely One and eternal, who has no partners or offspring, humanity is dual and reproductive. It seems that the gender dyad is so fundamental to the Qur’an’s teaching as to leave no room for either homosexuality or for more fluid definitions of gender (as in trans experience). Indeed, the latter possibility never seems to come up, while several tellings of the Sodom story not only make it much clearer than the Bible does that homosexuality is the big problem — but that such a practice was literally unthinkable before the Sodomites invented it. I wonder, though, if there may still be room to maneuver within Qur’anic terms toward a more open attitude to non-binary gender experiences and expressions. I have a sense that the purely negative theological role of the gender dyad may be the opening — the point of such declarations is to clarify humanity’s radical difference from God, rather than to make normative claims about human character. Presumably if humanity was more polymorphous, its difference from God would be even more strongly highlighted. Further, we can see evidence that God views variety (beyond duality) to be a positive benefit to humanity, as in 49:13, “O mankind! We created you from a single (pair) of a male and a female, and made you into nations and tribes, that you may know each other.” As with the gender dyad, the multiplicity of nations is not a curse or a failing (as in the Biblical narrative of Babel), but a positive opportunity for growth and communion. Could the same not be true of a more expansive view of gender experience and expression?